The weather in Eek, Alaska is a rainy 52 degrees today. Not hard to guess how it got that name. All the people on the city council took a look around and said EEK, we're stuck in Alaska!!! No really, I hear it's beautiful there sometimes. I would check it out for myself but I hear it snows there. One place it doesn't snow, is on the 405. And thank goodness too, because during the bumper to bumper commute, you would get buried under the snow from staying in one spot for too long on your way to work. 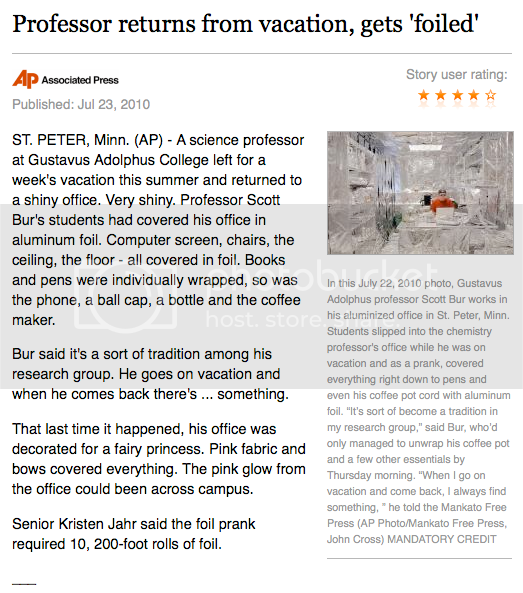 In the news, a Minnesota Science Professor returned home from vacation to find that his entire office had been covered in tin foil by his research department. It's become somewhat of a tradition for him to come home from vacations to some sort of prank, but this elaborate stunt required 10, 200 foot rolls of tin foil and hours and hours of man power. Even his books and pens were individually wrapped in tin foil. It's a good thing they like him. Foil is a little easier to get off than eggs. 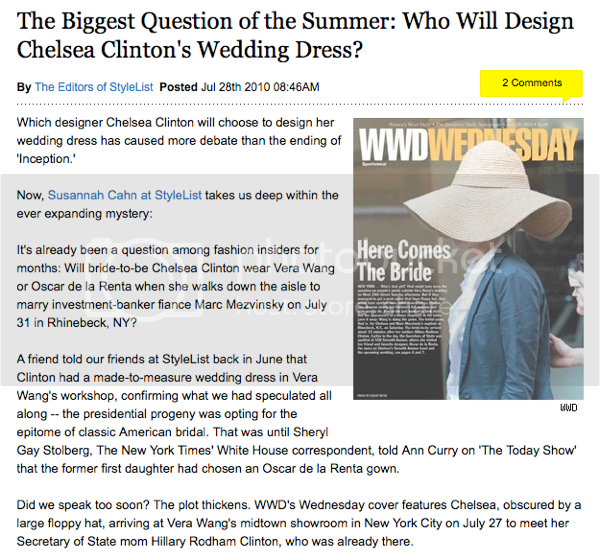 You may have heard Chelsea Clinton is getting married. I think that's sweet that someone was willing to look past the fact that she inherited the worst physical traits of both parents and got to know the person she is on the inside. Hey, that's not right. You guys shouldn't make me say stuff like that. I remember in college some guy told me I'd have to change dramatically if I ever wanted to get married, because the way I was at the time, no one would dare marry me. Shortly after that I met Mr. Ginger, who proposed at age 19 and married me at age 20. So there, stupid guy who told me no one would want to marry me. Incidentally, 15 years later that jerky mcjerkster just NOW got married. Poor girl. Anywho, here's Chelsea Clinton hiding her not-so-attractive face (stop making me say mean stuff like that people!) in a floppy hat. Or perhaps you want to make a statement about how an ugly duckling (stop it!!!) 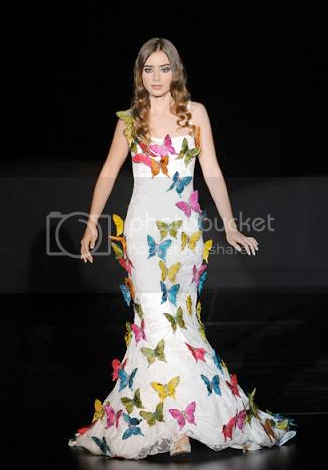 transforms into a beautiful butterfly on her wedding day, this might be the one for you. My last suggestion is one that should really send a message to your father, if you have any lasting anger toward him for his indiscretions. This could've saved him a lot of trouble and can make a social statement at the same time. 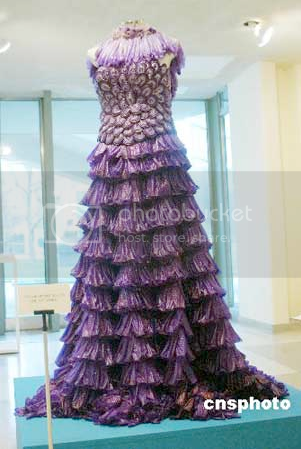 It's made entirely of condoms. 12,500 to be exact. So you see, Chelsea... who needs Vera Wang, when you have all these lovely creations to choose from? Speaking of things to wear, our WTF feature today is brought to you by Russell Brand. If that doesn't want you to see the remake of the movie "Arthur", I don't know what will. And that's all the time I have for today. Meet you back here same time, same place tomorrow. Until then, I have a little secret to share with you. Don't tell anyone or this blog will self-destruct. I guess you have to NOT be from Texas to not have heard about the Horned Toad, or "Horny Toad". Of course I've never seen it, just heard about it. Is it just the purple color on the dress that makes me go oooooo, then OH! That's so wrong! 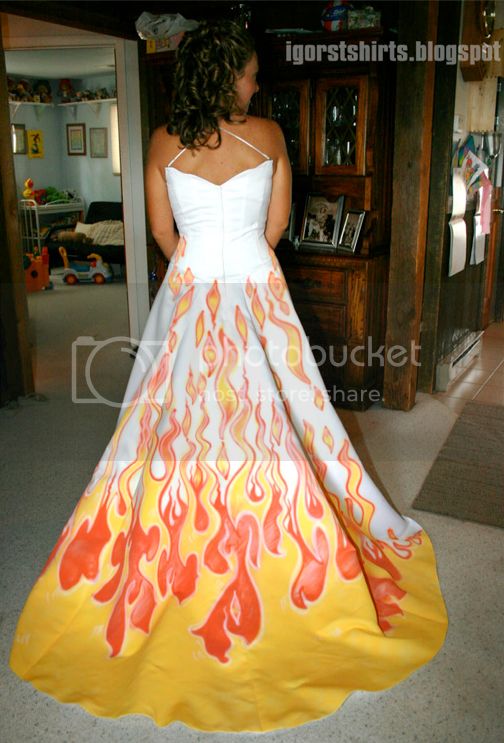 Im not sure which wedding dress is more scary. 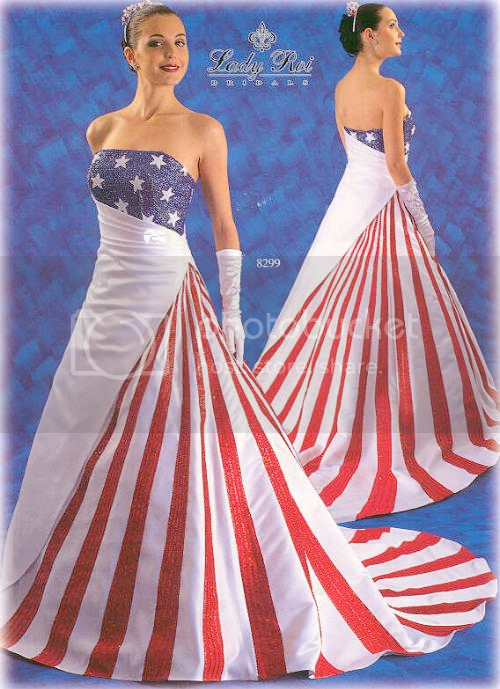 The condoms or the american flag. 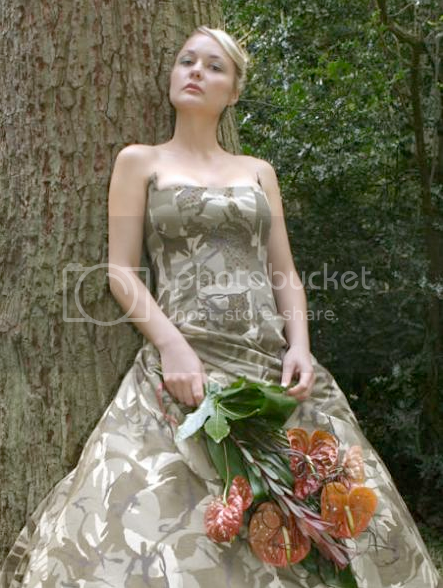 I actually know someone who would love the camo dress, which is frightening too.